Very cool solar LED flashlight called the "SunLight" is constructed using combination of foldable 3Watt solar panel and hi-power LEDs. This useful and unique gadget represent a very nice artistic creation as well. The SunLight was invented by Hermann Eske. 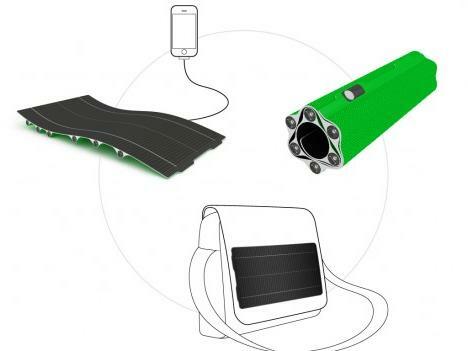 It is a solar-powered flashlight with foldable solar panels hidden beneath the main structure. You can easily add or remove additional LED units according to their requirements because the flashlight has been designed with scalability in mind. Each LED module unit comes with 2 pcs of AAA rechargeable NiMh batteries, where first module carries the LED driver and charge controller for more efficient use of accumulated solar energy. Charging time is approximately 3 hours in the sun, with clear sky above (no clouds), up to full battery capacity. Once fully charged, solar flashlight can last for almost 8 hours continuously. The energy generated by the PV panels can also be used to recharge many electronic gadgets like mp3 players, mobile phones, ipads or whatever you might be carrying on your camping trip. This is great gadget for someone who has already equipped the home with LED replacement bulbs. Solar LED flashlight is another product in the Core77 Design Competition – a product that integrates design and function very well, utilizing a flexible solar panel in a "roll" to form the standard shaped flashlight. The LED modules that insert into the roll also hold a charge controller including battery cells. 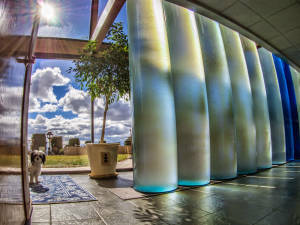 SunLight represents a unique type of solar LED product. It embodies all aspects, such as generation, storage and consumption of electrical energy in one unit. SunLight reduces waste. It is designed for a long life-cycle without the need to remove or change any elements. In the case of malfunction, parts can be replaced easily, decreasing costs for service. All that SunLight needs is solar energy – you simply unfold it so that solar cell film is exposed to the sun and the energy will recharge the batteries. Received power can be used in different ways, as a flashlight or for loading up connected gadgets (cell phones or music players, for example). 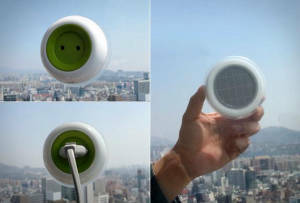 SunLight solar LED flashlight is scalable. The standard solar LED flashlight configuration embeds 6 modules, each consists of an LED unit and 2 AAA rechargeable batteries. Furthermore, one of the modules holds a charge controller. For more or less luminance/capacity, the size of solar cell film and with it the number of solar LED-battery modules can be varied proportionally. A low number of LED flashlight components reduces the production costs; production of different sizes requires just one new tool for the base material. Except for the batteries, all parts could be made of recyclable polymers.